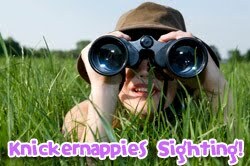 Knickernappies Sightings: Five Green Beans, Cloth Diaper Malaysia & Kozzy Bottoms! Another great International Knickernappies Sighting! Cloth Diaper Malaysia is hosting a Giveaway of 3 Knickernappies OS Diapers. The Giveaway is sponsored by Baby-Mel, a Malaysian Knickernappies retailer. Giveaway ends June 11 and is open to Malaysian residents only. New Retailer Five Green Beans is celebrating their Grand Opening! Knickernappies is proud to be one of the cloth diaper brands they chose to stock and we wish them all the success in the world. Stop by their cute new store and check out all that they have to offer. One lucky shopper during the week of their Grand Opening will receive a FREE gift! Want to win some Fluff Dust? head on over to the KozzyBottoms Blog and enter to win their latest Giveaway! Giveaway ends May 30, 2010. While you're there be sure to check out KozzyBottoms website! They have a gorgeous store and carry a great variety of products. Do you have a Knickernappies Sighting to report? We'd love to check it out. Comment with the URL. Thanks!